England’s First Queen, the Original Wicked Stepmother? – History… the interesting bits! England’s First Queen, the Original Wicked Stepmother? After writing an article about Edward the Martyr the other week, I thought it only fair to take a look at the other side of the story and write about Ælfthryth, England’s first ever crowned queen and Edward’s stepmother – and possible murderer. Author Annie Whitehead researched Ælfthryth for her book Alvar the Kingmaker and rather likes her. So she can’t be all bad – can she? Ælfthryth was probably born around 945; the daughter of Ealdorman Ordgar of Devon and an unknown woman who is said to have been descended from the royal family. As you can imagine, after the passage of more than 1,000 years, nothing is known of her childhood; although she had a least one sibling, a brother, Ordulf, who was founder of Tavistock Abbey. She was married around the age of 11 to Æthelwold, the son of Æthelstan Half-King (I have to do a post about him! What a name!) and ealdorman of East Anglia. 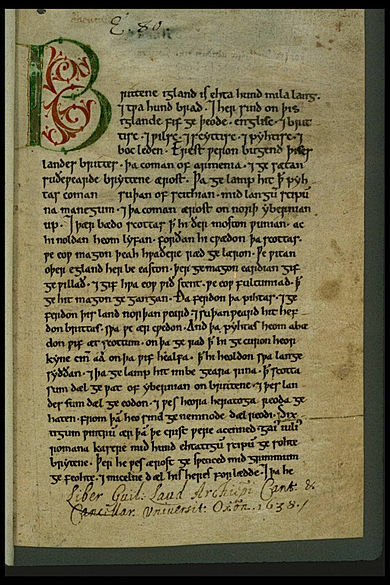 Æthelwold died in 962, probably in a hunting accident, although there were rumours of murder on the orders of his wife’s supposed lover, King Edgar. Edgar and Æthelwold would have known each other very well. After being orphaned as a baby, Edgar was raised in Æthelstan’s household alongside his own sons; of whom Æthelwold was one of the youngest. Some stories have Edgar wielding the dagger himself, while others don’t even mention murder. Whether the suspicion arose at the time of the event, or following Ælfthryth’s marriage to Edgar 2 years later, is also unclear. Edgar’s marital history was already chequered. Ælfthryth could be Edgar’s second or third wife; she was certainly the third relationship by which children were born. Edgar’s first wife, Æthelfled “the Fair”, was the mother of his eldest son, Edward (the Martyr). Following Æthelfled’s death, Edgar had a relationship with Wulfryth from which a daughter, Edith, was born around 963/964. The sources are uncertain as to whether or not Edgar and Wulfryth married, and some even suggest that she was a nun Edgar had seduced; although this may be confusion due to the fact that Wulfryth entered a convent shortly after Edith was born. Edith joined her mother in the abbey at Wilton, where Wulfryth eventually became abbess; in time both mother and daughter would be venerated locally as saints. Ælfthryth and Edgar were married in 964 and were soon the parents of 2 sons; Edmund and Æthelred. Despite having an older half-brother, Edward, it is Edmund who appears as Edgar’s acknowledged heir; his name being above that of Edward’s in a charter of 966, witnessed by both boys, which founded the New Minster at Winchester. Poor Ælfthryth must have been distraught when, in 971 and still only a child of about 7, young Edmund died. The grandson of Edward the Elder, and great-grandson of Alfred the Great, Edgar had been king since 959; however on 11 May 973 he had a coronation, at Bath Abbey. Whether this was his first coronation, or a second ceremony seems to be still debated by historians. Edgar was about 30 and the venerated Archbishop Dunstan of Canterbury officiated. It is the first known coronation of a queen of England, Ælfthryth. According to the Oxford Dictionary of National Biography there is a near contemporary account of the coronation, which depicts Ælfthryth feasting with many abbots and abbesses, wearing a silken gown sewn with pearls and precious stones. 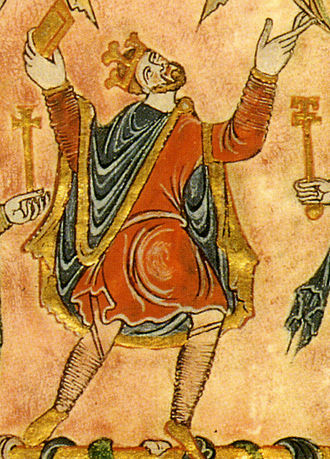 The coronation was an important display for Edgar and Ælfthryth, as a way to emphasise the legitimacy of their union, especially given Edgar’s marital history, and the claims of their children as Edgar’s heirs. Ælfthryth’s new position as a consecrated queen would give her surviving son, Æthelred, seniority over Edgar’s oldest son, Edward, whose mother was never queen. However, when it came down to it, Æthelred’s tender age was held against him, when Ælfthryth’s security was destroyed just 3 years later. King Edgar died unexpectedly at the young age of 32. With their eldest son dead and the youngest only 7 years old, the crown went to Edgar’s eldest son, the 12/13-year-old Edward. Edward faced opposition when Ælfthryth pressed Æthelred’s claim, supported by several leading figures, including Bishop Æthelwold of Winchester and her first husband’s brother, Æthelwine, ealdorman of East Anglia. However, with the backing of the revered, future saint, Archbishop Dunstan it was Edward who was crowned. Following his coronation Edward honoured his father’s promises to his wife, confirming the gift of jurisdiction over the whole of Dorset as Ælfthryth’s dower. As a consequence, Ælfthryth and her son, Æthelred, settled at Corfe, in the Purbeck Hills; it was a large estate surrounding a defensive mound, which would later become the Norman stronghold of Corfe Castle. And it was at Corfe on 18th March 978 that Ælfthryth’s reputation was irrevocably damaged, following a visit from 16-year-old King Edward. Whether Edward had been out hunting, or was in the area to specifically visit his stepmother and half-brother seems to be uncertain. However, he did send a message that he would be calling on them and Ælfthryth’s retainers were awaiting the young king at the gate, when he arrived with a small retinue. Still sitting in the saddle he was handed a drink; and stabbed. It must have been a horrific sight, as the king’s horse panicked and bolted, racing off with Edward’s foot stuck in the stirrup and the dying king being dragged along behind. 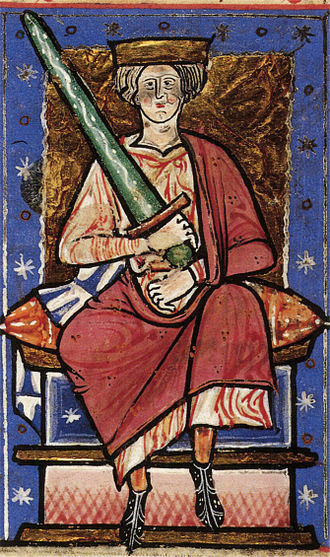 Although Edward’s brother, Æthelred, only around 10 years old but now king of England, was above suspicion due to his age, Ælfthryth had no such protection. Some traditions go so far as to accuse Ælfthryth of wielding the dagger herself. However, while most believe she was complicit in the murder, it is by no means certain and it is entirely possible that court malcontents, who had migrated to Æthelred’s corner, were responsible for the murder. 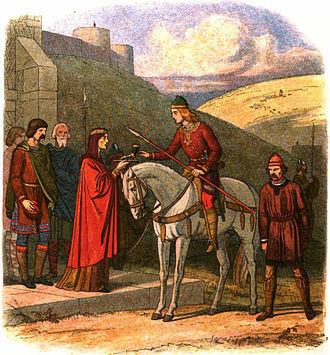 Ælfthryth rode out the ensuing furore and with her son as the new king, Ælfthryth was exonerated of any complicity; amid the necessity of stabilising the country, establishing the new reign and rescuing England’s reputation. Æthelred was crowned at Kingston, Surrey, on 4th May 979, a year after his brother’s death and just a few months after the reburial of Edward’s remains, with great ceremony, at Shaftesbury. A council was established to assist the young king in ruling the country, probably involving Queen Ælfthryth, who may have acted as regent during Æthelred’s minority; it also included the aging Dunstan, Archbishop of Canterbury, Æthelwold, bishop of Winchester, and Ælfhere, ealdorman of Mercia. As Dowager Queen Ælfthryth’s dower lands in Rutland and east Suffolk helped to extend West Saxon rule over East Anglia as a whole. Even when Æthelred was old enough to rule alone, Ælfthryth did not retire entirely. Following her son’s marriage to Ælfgifu of York, it was Ælfthryth who seems to have had the responsibility of raising their first-born son and ætheling, Æthelstan. Æthelstan died aged about 20 in 1014, 2 years before his father, and spoke warmly of his grandmother in his will. Æthelred and Ælfgifu had over 10 children together, including Æthelred’s eventual successor in 1016, Edmund II Ironside, before Ælfgifu died; Æthelred then married Emma of Normandy, mother of England’s future kings, Harthacnut by her 2nd husband, King Cnut, and Edward the Confessor by Æthelred. As queen Ælfthryth had substantial influence over the nunneries of England; she ousted the abbess of Barking, a cousin of Edgar’s second wife, Wulfthryth. She endowed convents at Amesbury and Wherwell; her granddaughter would eventually become abbess of the latter. And it was to Wherwell that the queen did eventually retire from the limelight, sometime before the year 1000, dying there on 17 November in either 999, 1000 or 1001. Over a thousand years later Ælfthryth’s actions and reputation are still being debated by historians. While it is not inconceivable that she played a part in Edward the Martyr’s death, we also have to be aware that women of power and influence were much vilified in Medieval times; a strong, independent woman would be blamed for many crimes, simply because she dared to know her own mind…. While I am not entirely convinced of her innocence, neither am I certain of her guilt. Ælfthryth’s career and influence, however, stretched far beyond that one action. As the first crowned queen of England, her prestige and honour is incomparable with those who had gone before her. And it is telling, perhaps, that her daughter-in-law, Ælfgifu of York, was never crowned, nor was accorded the title while her Ælfthryth still lived. The next crowned Queen of England was Æthelred’s second wife, Emma of Normandy, who married the king after his mother’s death. Footnotes: ¹ Anglo-Saxon Chronicle quoted by Martin Wall in The Anglo-Saxons in 100 Facts. Sources: Brewer’s British Royalty by David Williamson; Britain’s Royal Families, the Complete Genealogy by Alison Weir; The Wordsworth Dictionary of British History by JP Kenyon; The Anglo-Saxons in 100 Facts by Martin Wall; Kings, Queens, Bones and Bastards by David Hilliam; The Mammoth Book of British kings & Queens by Mike Ashley; The Oxford Companion to British History Edited by John Cannon; oxforddnb.com. Pingback: The Short Life and Sad Death of Edward the Martyr – History… the interesting bits! Another fascinating read. I’d heard of Aethelstan – the name, anyway – but not her. When I first read your blog post headline, I immediately thought you’d be writing about Boudicea (sorry if I spelled it incorrectly) but this queen is far more fascinating. I do wonder if she were truly involved in King Edward’s murder. You can see it both ways, I think. She was a powerful woman in a time when men primarily held power, and no doubt had enemies that would do anything to smear her reputation. On the other hand, she was no doubt a protective mother and protective mothers would probably do anything for their children. Thank you for sharing this article and the life of yet another historical personage. I truly enjoy your posts and always learn something new. Excellent point about strong women being vilified. I wonder if this has completely changed, yet, or if there are still remnants of that around today. Thank you Christoph. I think there are definitely still some tenants around today, though it manifests in women having to be better, smarter and stronger at their careers, just to get some recognition. Pingback: King Eadwig ‘All-Fair’ – History… the interesting bits! Pingback: King Eadwig ‘All-Fair’, a Wanton Youth – History… the interesting bits! Bernard Cornwall has used this era in his books where there are so many strong women who wield such power. He says the Saxons did not allow women to be crowned? This is an interesting and fascinating time and your post has shone a new light into the darkness. Thank you. Pingback: Ӕlfgifu of York – History… the interesting bits!